Everyone has a deep set of core values that they hold dear. These values have a strong influence on our personality, in addition to our personality having a strong influence on them. Although there may be lots of interweaving and complex experience behind our value choices, and a lot of corollaries extending from them, once we identify the essence of our value system often it can be readily distilled. Many bright leaders of all different personality types have explored their own value systems, and have come up with their own exemplary statements. In this chart, we will explore these. The first of the clear divisions in value patterns lies between the thinking types and the feeling types. The feeling types hold lofty, poetic ideals, and aspire to find happiness in love, kindness, and enthusiasm for what they do. The ISFJ finds its place in love and being loved. 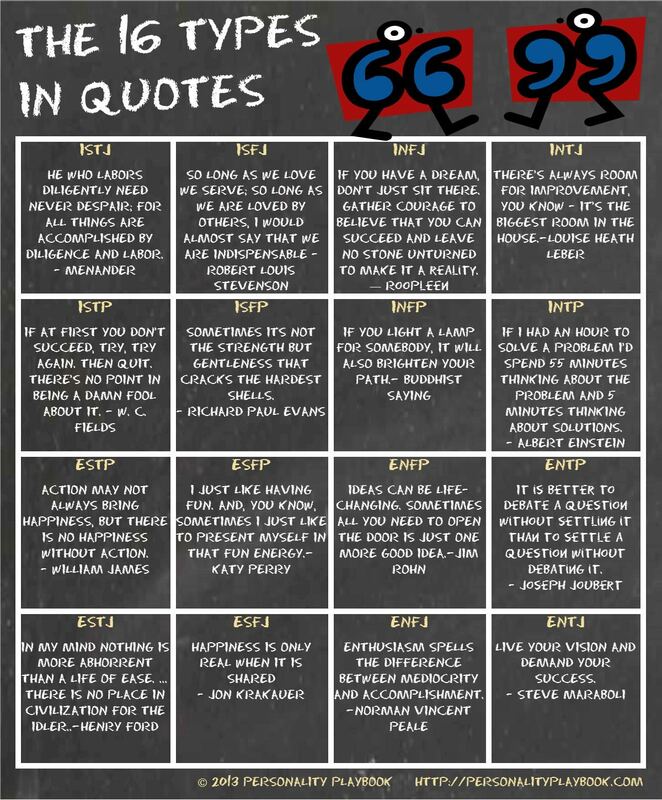 The ESFP bursts with constant enthusiasm and whimsy. The thinking types, on the other hand, are not as well described as “enthusiastic” as they are by “ambitious.” The ISTJ finds comfort in stoicism; he need never despair if he labors diligently. The INTJs always look for improvement, and the ENTJs demand their success. Although it’s more noticeable among the judging types, it shows even in the ESTP, who declares that there can be no happiness without action. Another clear divide exists between the judging and perceiving types. The perceiving types are strongly characterized by openness, whereas the judging types are characterized by their propensity for action. The ESTJ finds no ease, the INTJ finds no perfection. The ISTJ, no loss in willpower, the ISFJ, no deficit in enthusiasm. The FP types manifest their openness in their ability to empathize, whereas the TP types manifest it in their love of using or playing with ideas. Sensing types value the tangible and real. The ESFJ holds that happiness is only “real” when it is shared. The ISTP quote shows that although they might love to play with ideas like the INTP, they still have a realistic side and will give up when something is just not possible or useful anymore. In contrast to this, the intuitive types tend to be much more idealistic, thinking of the world in terms of what it could be rather than what it is. Where the INTJ always looks to improve to perfection, the INFJ seeks to make dreams reality. Finally, the clearest divide exists between the introverts and the extroverts. The key characteristic about extroverts is that they like to be heavily intertwined with the world around them. Though an INTP will sit all day by themselves simply pondering, the ENTP will join the debate team. A propensity for impact, however, is also a characteristic of judging types. The key difference is that IJs tend to make their changes quietly, whereas EJs love to make huge, impactful changes. ESFJ believes that happiness is only real when shared, while the ISFJ does not need to share, he needs only to serve. Without a doubt, our personalities and our values form a symbiotic relationship. 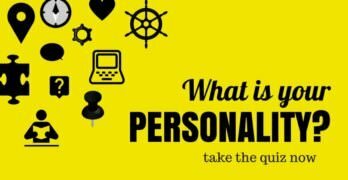 As a result, exploration into our personalities can reveal whole new insights into our value systems. 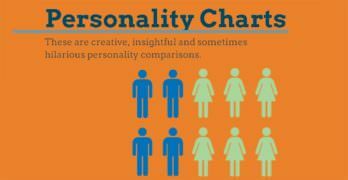 Now that you know where you fall on the personality spectrum, which one resonates with you?